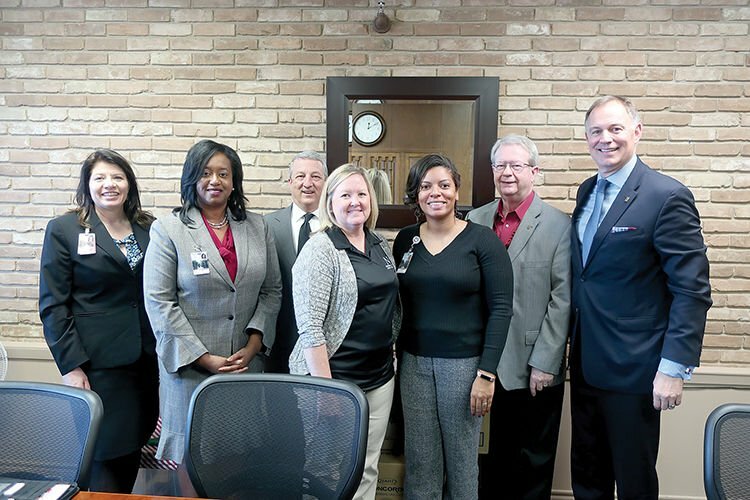 From left, Navarro College leadership team members Terry Gibson, Waxahachie campus dean; Tammy Galloway, executive dean of workforce training and career and technical education; Guy Featherston, Midlothian campus dean and dean of health professions; Leslie Hayes, director of adult education; Dr. Micaela Herndon, director of continuing education and workforce development; Dr. David Lewis, community liaison; and Dr. Kevin G. Fegan, district president. Navarro College leadership members are encouraging the community to check out the variety of ways it’s able to meet educational needs, especially through its Ellis County campuses in Waxahachie and Midlothian. If you think higher education isn’t for you or isn’t available to you, think again because it encompasses much more than a traditional degree. Educational pathways range from college-industry partnerships providing specialized training to certificate programs that can pave the way for a promotion. Higher education components also include counseling and advice on how to successfully make a career change as well as the possibility of receiving credit for one’s work/life experience. With the arrival of new district president, Dr. Kevin Fegan, in September, a renewed focus has been placed by Navarro College on serving the diverse constituencies found across its five-county service area. Strategic planning processes are already under way on the college’s four campuses (Corsicana, Mexia, Midlothian and Waxahachie), with each having been directed to engage with its local community to find out how best to serve its needs. “Each campus is to have a strategic plan through 2030 that will show where we place our emphasis and resources over the next 10 years,” Waxahachie Campus Dean Terry Gibson shared with the Sun during a recent interview. At the same time, there’s a primary goal of raising awareness of what all Navarro has to offer for learners, whether that’s GED and ESL classes, continuing education offerings, certificate programs, applied degrees and transfer coursework toward a four-year program, among others. Navarro’s traditional spring semester kicks off this coming Monday – but Gibson and the other leadership team members who met with the Sun emphasized there are many paths available to people interested in furthering their education. 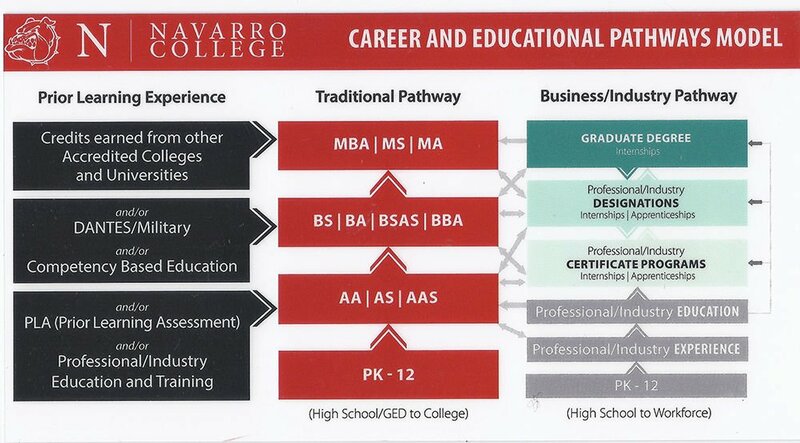 Beyond the traditional pathway that sees students move from high school onto an associate’s, bachelor’s and possibly then a graduate degree, two other pathways identified by Navarro are the business/industry pathway and one of prior learning experience. The business/industry pathway includes professional/industry education and or experience; certificate programs and designations that include internships and apprenticeships; and also graduate degrees. The prior learning experience pathway incorporates credits earned elsewhere, DANTES/military studies, competency-based education, prior learning assessments and or professional/industry education and training. As part of this pathway, Navarro is working on policies that will allow it to assess prior learning for credit, with the goal to have that possibility in place this spring. A first step toward more education might mean completing one’s GED at Navarro and then moving into a continuing education class. From there, work can be done toward a certificate and or accreditation. In particular, Featherston said he’s seen students start out in continuing education to become a CNA, CMA or phlebotomist – and then use that certification as a stepping stool into one of the college’s nursing programs, which are all now taught at the Waxahachie campus. Currently, there are about 60 students in the LVN program and more than 100 in the associate degree in nursing (RN) program at Waxahachie; Navarro’s occupational and physical therapy programs are at the Midlothian campus. Although still in the planning stages, Featherston anticipates Navarro adding a respiratory therapy program in the future, as an example. And nursing is just one of the programs offered through Navarro that can further someone’s educational desires. The mission of a community college is to serve and that includes listening to its constituencies, understanding their differences and recognizing the opportunities where it can meet a variety of learners’ needs, he said. Navarro’s current strategic plan is for 2015-2020, with the plan under development to take it from 2020 through 2030. Both are aligned with the state of Texas’ Higher Education Board’s 60X30TX plan that was published in 2015. The primary goal of the state plan (and reflected in its name) is for 60-percent of Texas ages 25-34 to have some type of certificate or degree by the year 2030. Three additional goals set for statewide achievement by 2030 include at least 550,000 students receiving their certificate, associate’s, bachelor’s or master’s from a Texas higher education institution; for all higher education graduates to have completed programs with identified marketable skills; and for undergraduate student loan debt to not exceed 60-percent of projected first-year wages. She encourages people thinking about furthering their education to stop by the Waxahachie campus and meet with an advisor, all of whom have walk-in appointments available. It’s an opportunity to learn more about the college’s many different programs as well as the availability of student services such as financial aid, child care and transportation. “Come talk to us and we can help you get ready,” she said.